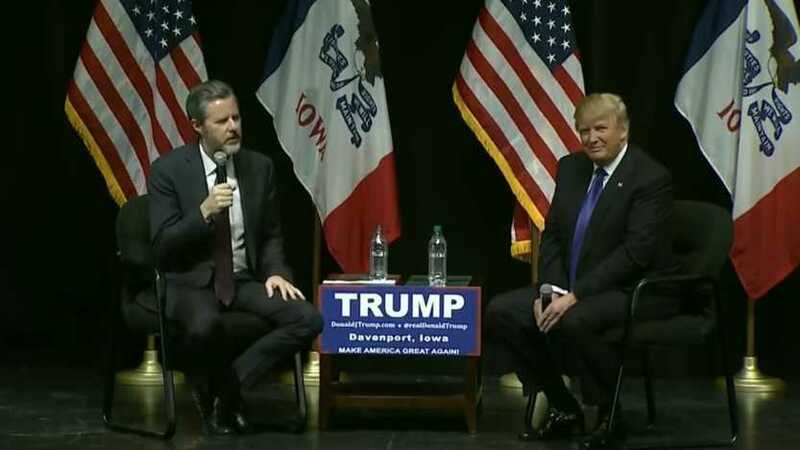 DAVENPORT, Iowa — Jerry Falwell, Jr., the president of what heralds itself as the world’s largest Christian university, joined Republican presidential candidate Donald Trump on stage Saturday and Sunday during campaign rallies in Iowa to help garner support from evangelical voters days before the Iowa caucuses. “We need someone other than a career politician,” said Falwell, who formally endorsed Trump last week, repeating many of the statements he had made in recent days about Trump’s generosity and that the candidate reminds him of his father. CNN reports that Falwell’s “praise was effusive—at times almost fawning—as he essentially told the Davenport crowd that he was willing to take the heat over his decision” to endorse Trump. He asserted that when a parent has a sick child, they take them to the best doctor whether or not that doctor goes to their church. Falwell said that his father had likewise been criticized for supporting divorced actor Ronald Reagan over Sunday School teacher Jimmy Carter. As previously reported, during Trump’s visit to Liberty University last month, Falwell spent ten minutes providing an introduction for the presidential nominee, painting a picture of a man whose life has been marked by good deeds. Falwell made similar comments to Fox talk show host Sean Hannity that same day. “He may not be a theological expert and he might say two Corinthians instead of second Corinthians, but when you look at the fruits of his life and all the people he’s provided jobs, I think that’s the true test of somebody’s Christianity not whether or not they use the right theological terms,” he contended. But some have expressed concern about Falwell’s actions.